The old walled city of Intramuros, which encloses Fort Santiago, San Agustin Church and Manila Cathedral contrast greatly compared to the modern skyscrapers in Makati or luxurious hotels along Roxas Boulevard. Nayong Pilipino is a one-stop tourist destination, a theme park that features miniature versions of Philippinesโ€� famous landmarks and showcases the rich culture of the Filipinos. Across from Manila Bay is the island fortress of Corregidor known as โ€�The Rockโ€�, where remnants of the Mile Long Barracks still stand. Locals often escape to nearby resort towns like Laguna for its natural hot springs and waterfalls or to enjoy the cool climate of the highlands at Tagaytay. Popular daytrips from Manila include Baguio - summer capital of Philippines, white sandy beaches in Subic and Banaue with its famous rice terraces. Book a hotel in Manila now to experience the heart and soul of Philippines. The New Solanie hotel New Solanie is located in the centre of Manila, in Malate area, the well-known restaurants & bar area of Manila. Hostel 1632 is located at Malate, is accessible to the nearest shopping centers, tourist spots and golf course. It is very close to the famous Robinson's Place Manila and nearby to Manila's well known convention centers such as Folk Arts Theater, Philippine International Convention Center and World Trade Centre. Makati Prime Tower Suites strategic location offers easy access to the Domestic and International Airports and Makati's Business District. The hotel Las Palmas is located in the heart of the Ermita area, a very lively district with many restaurants and few steps from the Robinsons shopping malls. The hotel Executive Plaza is located in the heart of vibrant Malate. Bars, restaurants, shopping malls, convention centers, and historic landmarks are a short distance away. The hotel is located in Makati City and is conveniently located near Makati's business, commercial and entertainment areas. The Hotel Richmonde is conveniently located in the heart of the Ortigas Business and Commercial District and just walking distance to shopping and recreation centre. The hotel Pavilion is located opposite Rizal National Park and near the historic walled city of Intramuros, Pavilion Hotel is 15 minutes from the Philippine International Convention Centre. 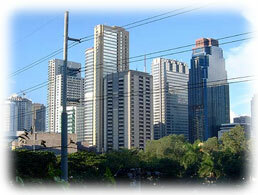 Discovery Suites is located in the heart of the Ortigas Centre. It is within close proximity to corporate offices, shopping malls and restaurants. It is 14 kilometres or about 45 minutes drive from the International airport. The Manila Hotel fronting Rizal National Park and Manila Bay, is just beside the Club Intramuros Golf Course, open day and night to all golfers. It is walking distance to the old Spanish city called Intramuros, which is Manila's top sightseeing spot. The hotel Shangri-La Edsa is situated at the crossroads of EDSA and the Ortigas Center in the Mandaluyong commercial district of Metro Manila and is set in a natural lush environment with colourful gardens and tall green plants. The Pan Pacific hotel is situated in the center of the vibrant Adriatico restaurant and entertainment district, in the heart of the "Spanish Quarter" of Manila Bay.